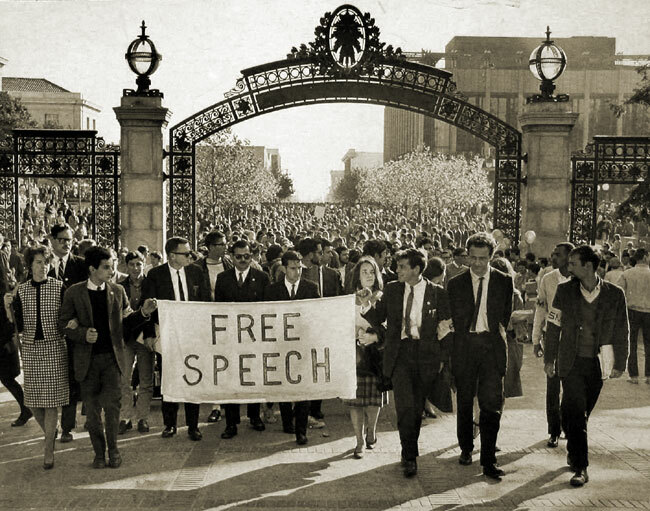 One wonders how many of those neatly attired and jubilant Berkeley students who bought into 1964’s Free Speech Movement would be shocked by today’s censorship. My guess is “none.” It was always about Leftist re-education. The People’s Republic of Berkeley or, as it’s more commonly known, the University of California, Berkeley, has stayed true to its core Orwellian Leftism by banning language. Today’s targeted “bad thinking” is the phrase “illegal immigrant.” According to the censors occupying Berkeley’s student government, that phrase is “racially charged,” “dehumanizes” people, and contributes to “punitive and discriminatory actions aimed primarily at immigrants and communities of color.” Apparently the truth hurts. Actually, the ultra-Left Berkeley was late to the party on this one, but that’s only because the University of California in Los Angeles has a much higher population of illegal immigrant students. That’s almost certainly why UCLA passed a similar resolution in August, while Berzerkley didn’t get around to it until November. “No human being is illegal. ‘Foreign nationals,’ ‘undocumented immigrants,’ ‘immigrants without papers’ and ‘immigrants seeking status’ are examples of terms we can use that do not dehumanize people. You can use all the metaphors you like, dear little UC Berkeley soviets, but the fact remains that, to the extent these people are in America in an undocumented way without papers, it’s because they broke the law by sneaking over the border like thieves in the nights. In other words, adjectively, they’re immigrants who are here illegally, which makes them – yes, wait for it — ILLEGAL IMMIGRANTS. The problem, of course, isn’t the words. It’s the behavior. You can dress mutton up as lamb, but it’s still mutton. And someone who sneaked over the border in violation of our nation’s laws is still illegal no matter how frilly the words you drape around that person. Considering that greater than 90% of Berkeley’s administrators and faculty members are the ones who trained these junior Leftists, it’s actually funny to hear the students demand that their mentors need re-education. Of course, that’s the way it happened in China too, when the younger generation decided that the elders who ushered in Communism showed inadequate fervor in their commitment to the monster they had created. It was these radicalized students who ushered in Mao’s “Great Leap Forward,” complete with 50-70 million dead Chinese citizens – all of whom no doubt starved to death joyfully thanks to their contribution to the great communist cause. As for the sole abstention, it’s worth noting that he’s probably ready for re-education too. Student senator Solomon Nwoche agrees in principle with the resolution, but thought it was a waste of time. That shows practical intelligence. His real sin, though, was in his sneaking respect for freedom of speech and the marketplace of ideas. He was disappointed, he said, that, when a single person tried to speak out against the resolution, the student senators laughed at him or, even more disgustingly, turned their backs to him. UPDATE: I should add here that I agree that America’s immigration laws are dreadful. Having said that, it’s up to America to change her laws, not for illegal immigrants to change them by ignoring them. (Well, in theory that’s the case. In fact, the Obama administration is also changing them by ignoring them.) We also should start putting pressure on Mexico. Immigrants come here illegally because Mexico is so shamefully corrupt and poorly run that a country rich in resources, but natural and human, is mired in poverty, and because Mexico charges its citizens such heinous amounts to allow them to leave the country legally that poor are stymied both by America’s laws and by Mexico’s. A fix is a good thing; disrespect for our country’s borders and laws is a disastrous thing, going to the sovereign integrity of our nation and her citizens. I’ve never understood hunger strikes. That is, I’ve never found them a compelling means of moral persuasion. To me, they’re a form of emotional blackmail in lieu of reasoned argument. Still, that doesn’t stop their popularity, and some Berkeley students are now abstaining from food to protest an Arizona law that gives Arizona law enforcement the right to enforce federal law. Given that a strong majority of Americans support Arizona’s law (perhaps because they have a better understanding of the law and the chaos in Arizona border communities than do Berkeley’s perpetually agitated and undereducated students), I foresee the students either eating or dying without having any effect whatsoever on public policy. The decision could cost the school district, which is facing a $113 million budget shortfall over the next two years, at least $120,000 a year – enough cash to cover the salaries of two classroom teachers. The school board is expected to vote Tuesday on the fiscally controversial resolution calling for San Francisco Unified to add a new full-time staffer to manage “lesbian, gay, bisexual, transgender and questioning” youth issues in the district’s Student Support Services Department. It also would require the district to track harassment and discrimination based on sexual orientation and distribute an educational packet to parents, encouraging them to discuss “the issues of sexuality, gender identity and safety” with their children. It’s also worth thinking about how San Francisco’s school system currently ranks (and this ranking is before the projected cuts to academics have gone into effect). Out of 752 school districts in California, San Francisco comes in at 382 — a little over halfway to the bottom. It could certainly be worse, but considering San Francisco’s prestige and sophistication, that’s a pretty pathetic showing. Of course, San Francisco isn’t alone in this desire to appease minority sensibilities at the expense of the majority. Berkeley, right across the Bay, garnered significant headlines when its school district proposed cutting science programs (that is, solidly academic programs) because not enough minorities were signing up for them. After an uproar from parents who care more about their children’s education than parading them as sacrificial lambs to Progressive politics, the school district has backed off the plan, at least for now. What’s so fascinating about these Progressive initiatives is that they are not being put in place to address manifest wrongs. That is, I don’t see any argument that black and Hispanic students are being discouraged from taking science classes in Berkeley, or that they are the subjects of rank discrimination. Likewise, the San Francisco school district isn’t using an epidemic of anti-gay violence to justify redirecting funds from academics to a designated victim group. Instead, this is simply the Progressive mindset at work: minorities are victims; victims need reparations; within the context of public education, reparations come in the form of denying academic opp0rtunities to all students (including, of course, the victims themselves). I know I’m sounding like a broken record, but I’m beginning to think that, provided Obama doesn’t bankrupt us or Iran bomb us, Obama’s election may be a blessing in disguise. Progressives outside of power managed to convince vast swathes of America that Progressives were interested only in the good of all, while inherently evil conservatives were dedicated to the destruction of everyone but white males (plus a few pro-Life pseudo-females). The election, however, has gone to the Progressives’ heads. They are revealing themselves in all their ugliness. When it comes to education, their goal isn’t to educate children, but to indoctrinate them in an anti-American, anti-Israel curriculum that elevates victim status over academics. On abortion, they’re not pro-Choice, but pro-Death. On national security, their anti-Bush diatribes proved to be rooted in an affinity with the terrorists over the interests and security of Americans. Their ostensible concern about the economy is merely an umbrella to transfer all wealth to the government. You can add to this list, ’cause you know where I’m going. Before the election, we saw the eternally pure and youthful Dorian Gray; now we see the picture in which reposes all the actual ugliness and evil. Berkeley officials Tuesday stood by their plan to require homeowners to make extensive energy efficiency improvements to their homes, but appeared to back off the more costly elements of the proposal. Depending on the house and the residents’ energy habits, the improvements could be as little as $100 for caulking and sealant, or upward of $30,000 for a new roof, windows, appliances and furnace. The upgrades are part of the city’s 145-page Climate Action Plan, which the City Council was expected to approve Tuesday night. In addition to home improvement requirements, the plan calls for a broad range of Earth-friendly programs intended to help the city meet its Measure G goal of reducing greenhouse gas emissions by 80 percent by 2050. The portion of the plan that applies to home improvements sparked an uproar this week from residents fearful the city would require them to spend large sums on new windows and other pricey amenities. They may have to in the next 10 to 15 years, but probably not now, Marks said. Right now, I suspect that some homeowners have taken their little AlGore dolls, formerly placed in positions of honor on their desks and shelves, and are sticking pins in them. UPDATE: The Berkeley City Council discovered very quickly that, to the extent it affects their financial interests, people are green only if they want to be green, not if the government forces them to be. The City has therefore withdrawn, at least temporarily, its plan to invade people’s homes and dictate the details. Time to get out the straitjackets again…. Berkeley’s City Council will delve into national policy again next week when it votes whether to demand the United States charge Berkeley resident and former Bush adviser John Yoo with war crimes. Yoo, a tenured professor at UC Berkeley’s Boalt Hall School of Law, wrote the memos offering legal justification for torture while he worked for the White House from 2001 to 2003. The City Council will vote Monday on the five measures. In addition to demanding that Yoo be charged with war crimes, the city will decide whether to order Boalt to offer alternatives to Yoo’s courses, so no student is forced to take a class from him if they don’t want to. Yoo has taught constitutional and international law at Boalt since 1993. I found Berkeley a desperately unpleasant place when I attended University there in the late 70s/early 80s. It shocks me to realize that, unaware of it though I was, those were the good years. In a report filled with photos and text, Zombie walks us through the depths to which Berkeley has sunk. And I’m not going to excuse the City from this kind of thing on the ground that the protesters were just a small percentage of the whole population. Keep in mind that it was the general population that elected the City Council that started this whole thing in the first place. I also want to add here that it’s too facile just to say, “Well, that’s Berkeley. It’s always been a nutty place.” While it’s true that Berkeley’s always been nutty, there is a unique quality to this nuttiness and others should take note. This is not just a collection of eccentrics. This is the stripped down mask of the left — take the vague anti-Capitalist, anti-American, anti-military, anti-democracy, anti-Israel, racist (er, identity politics) rhetoric that permeates the soft Left, distill it to its essence, and this is what remains. Without Obama’s warm fuzzies, and Hillary’s soccer Mom platitudes, these are the underlying faces of their core beliefs. And you should definitely not forget these pictures come November. One more thing about Berkeley: it was not always so. Growing up, my next door neighbor was an absolutely lovely maiden lady (when that idea still existed) who came from an old San Francisco family. She had been born and raised in San Francisco, and used to entertain me with harrowing tales of the ’06 quake, when you could go into the yard of their home (miraculously preserved but for a collapsed chimney) and read a newspaper at night by the flames destroying the City. She also told me about attending Berkeley around 1913 or 1914. When I commuted to Berkeley decades later, I battled my way through City traffic, battled my way through freeway traffic, battled my way to Berkeley traffic, and parked in neighborhoods so scary the campus cops were barred from escorting students there because of safety concerns. When my neighbor commuted to Berkeley, she took a streetcar to the ferry. Once on the ferry, she and her friends (no doubt in lovely flowered hats), always treated themselves to tea and fresh pastries. After they docked at Berkeley, a horse drawn carriage would be waiting to drive them to the center of campus. She always looked back on those years as a remarkably civilized time and bemoaned what the hippies had done to her once lovely alma mater. After a day of enraged confrontation outside Berkeley City Hall between anti-war and pro-military demonstrators, the City Council appeared ready late Tuesday night to rescind its controversial decision to tell the U.S. Marines they are “unwelcome intruders” for operating a downtown recruiting center. Clearly, the “Progressives” believe that you can fool all of the people all of the time and, with a complicit media, they may almost be right. This is basically behind the anti-Marine side. Note a tent – many of them spent the night and they didn’t bother to take them down which is why they have so little space. Also notice the “reproductive” sign – these guys recycle signs since they go to so many protests. It pretty much tells you way more than you need to know about these people, doesn’t it? They’re professional agitators. They have no lives. This is what they do. UPDATE: You’ll find more ProtestShooter photos here, showing what went on in the afternoon. UPDATE II: Zombie has got photos up too. Since the Iraq War began, the Left has attempted to disassociate itself from the ugliness of 1960s anti-War protests by repeating, over and over, “We love the troops. It’s just the War we hate.” That line always had a stilted quality, especial since we have a volunteer army, and our troops are willing to serve in this war. This little charade may well be over now, since the hoo-ha in Berkeley has peeled away any attempts amongst the radical Leftists to praise the troops while criticizing the war. But around noon, things heated up as more than three dozen police with batons and riot gear formed a line to separate the two sides. The police intervention occurred after several dozen demonstrators who want the recruiting center to leave town crossed the street and engaged in a 15-minute shouting match with a group supporting the Marines. There were no arrests. Linci Comy of Oakland said she was there for future generations. These sentiments have absolutely nothing to do with the War in Iraq. It is a wholesale rejection of the military on the grounds that it is inherently brutal and debased and, as such, should be offensive to all who do support the military in America, irrespective of their views about the wisdom of this War. I found that last emphasized statement especially interesting: “military recruitment is no longer acceptable.” Aside from disliking the military, these people would very much like to leave America without any military at all. They espouse what might be called the Blanche duBois school of national security, because they’d like America to be dependent on the kindness of strangers — strangers such as Osama bin Laden, Khalid Sheikh Mohammed (who came up with the idea of 9/11, and boasts, not only about 9/11, but about having personally beheaded Daniel Pearl), Mahmoud Ahmadinijad, Hafez al-Assad, Kim Jong-il, Vladimir Putin, and many other of the worlds’ most powerful, devious or dangerous (or all of the above) psychopaths. By the way, what do you bet that these same anti-military people have no problems with warriors if they are Palestinians, or Cuban soldiers, or Chavez’s troops or qualify in some other way as oppressed or anti-capitalist? The really dirty truth here is that, while these speakers insult American troops in the most vile terms, what they really hate is American power. And since they recognize that the troops are an inevitable and necessary part of that power, they see destroying the military, not just as an anti-War move, but as the first grand move in the total destruction of the United States. As for me, I’m with George Orwell: “People sleep peaceably in their beds at night only because rough men stand ready to do violence on their behalf.” To all you rough men (and women), my eternal thanks. UPDATE: I haven’t figured out yet how to upload videos at this new site, but I think this gloriously harmonized Abba song (and, yes, I like Abba) is a great tribute to our troops, since it’s a reminder that soldiers do what they have to do, moving forward in battle serving as an inspiration to the rest of us in good times and bad.